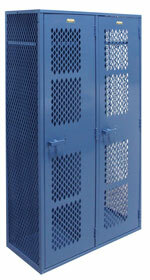 Vented heavy duty metal athletic lockers for gym, stadium or spa. Gymnasium lockers need to give athletes the proper amount of space to keep their personal belongings safe while practicing or performing, as well as any uniform or equipment they need when away from the facility. Vented gymnasium lockers are perfect for athletes as they can maintain a constant air flow in order to reduce an unwanted scent being made within the locker. Metal lockers are the favorite choice since they are available in various sizes, designs, and prices. Metal gymnasium lockers are built to last for many years in high traffic areas, which is only one of the advantages to having a metal locker. The Athletic Series Vented Lockers are perfect for any gymnasium setting. They are made with heavy duty steel and come in one, two, and three tiers. You can mix and match your order to have different tiers so you will be able to fit as many gymnasium lockers as possible in the locker room. The doors and sides of these lockers are designed with diamond perforated metal for maximum airflow while still keeping the contents of the locker safe and secure. There are 21 different colors to choose from so you can easily select which works best for your organization. Box Vented Lockers are great for areas that have many different athletes using the facility. Although they’re smaller in size they can still hold various personal belongings when not in use. These gymnasium lockers are made with 16 gauge steel and come in three different depth sizes so you can choose which will fit best in your facility while taking into consideration how much room your athletes need for storage. Each door has been designed to be used with a padlock for secure storage space. Box vented lockers are perfect for facilities that don’t have enough space for larger gymnasium lockers but still want them to allow airflow to keep unpleasant scents from taking over. Pro Tough Lockers work perfect for gymnasium settings with their sleek design and vents in both the sides and doors. There is more than one design for the vented door system so you can choose which you would prefer for your facility. You can also decide if you want the sides to be vented or solid. There are two different heights and you can choose between one and two tier locker units. This gymnasium locker has been made with athletic locker rooms in mind since it can withstand high traffic areas without you having to spend money and time on maintenance. All Welded Lockers is another type of gymnasium locker that provides airflow while still keeping the contents of the locker safe from unauthorized persons. These gymnasium lockers will come preassembled to keep you from having to spend time putting them together. You can choose between one, two, and three tiers to guarantee you can have the amount of lockers you need for your gymnastic athletes. While these lockers can come with solid doors and sides, you can choose to have them ventilated, which is something all athletes prefer. There are many different colors to choose from so you can easily maintain the team spirit by matching the lockers to your team’s colors. This article was published on Monday 26 January, 2009.